A few weekends ago, I met some friends at The Druids Arms as I had heard that their kitchen, the Big Eats Co, were offering an exciting selection of gluten free dishes which, of course, I had to try. The Druids Arms is located parallel to London Road, opposite The Level, and is a cosy, friendly, neighbourhood pub, popular with locals and students. The Big Eats Co serve Southern American, home-smoked, soul food, and are an exciting, relatively new addition to the Brighton food scene. I visited on a Saturday evening so there was a nice atmosphere, as the pub was slowly filling up with Saturday night punters and other customers who were just there to enjoy a meal. The pub was dimly lit with candles, which made it feel very warm and welcoming on the chilly evening. They do have a courtyard out the back too for the warmer months. The courtyard looked like a nice place to enjoy a pint or a refreshing gin and tonic in the sun with your meal. There is no set restaurant area in the pub so you can sit and eat wherever you please, but it means that it isn’t table service so you will have to order at the bar. The menu is mainly made up of smoked dishes using locally-sourced, free-range meat, with vegetarian options too, and they really made a great effort to cater for all types of dietary requirements, so don’t be shy to ask the chef! 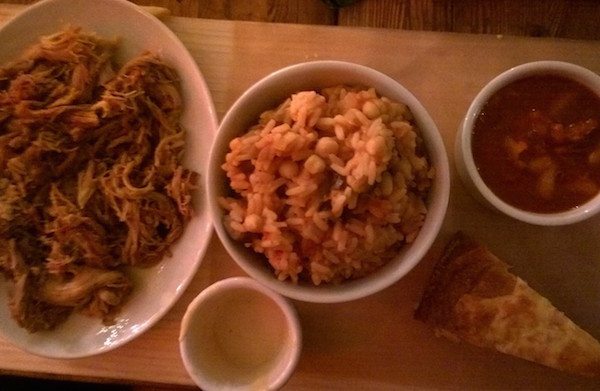 Some dishes include; cajun pulled pork with homemade BBQ beans and smoked cheddar cornbread (GF on request), brisket of beef with smoked garlic mash and Harvey’s Ale liquor, twice smoked BBQ ribs served with buttermilk fried chicken wings, fries and an apple slaw. 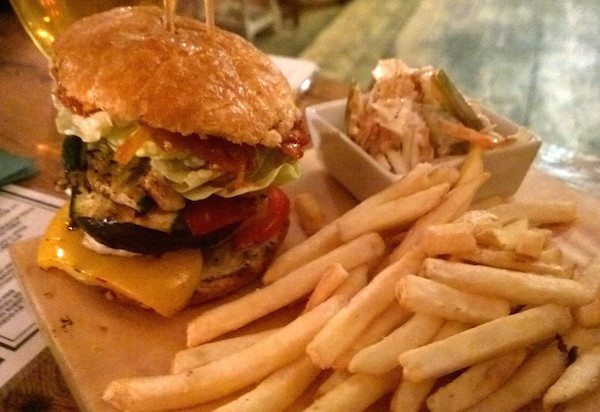 They also serve a range of mouth-watering burgers on homemade buns, including smoked and marinated pork loin with scotch bonnet salsa, and a pineapple and rum chutney, or a veggie stack with butternut squash, cajun marinated vegetables and house smoked halloumi – all served with fries. Have I made you hungry yet? I was at the time – I found it so hard to choose what I wanted! Luckily, I was here with quite a few friends so we decided to get a selection of light bites to share, and then have a main dish each afterwards. We asked the chef to bring us a few of his choice, as none of us could make up our minds, and I wanted to try what he thought was best! After what seemed like only a brief wait, our food was brought over and it looked amazing. 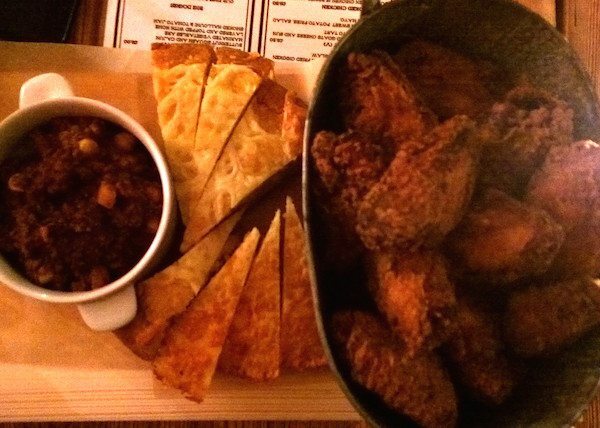 We were brought sweet potato fries with a selection of dips (GF), smoked cheddar cornbread (GF) with beef chilli (GF), onion strings, and a bucket of buttermilk fried chicken wings. 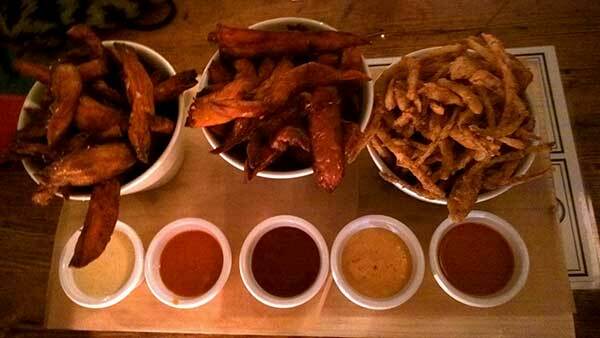 You can get the chicken wings naked if you like, with their homemade gluten free BBQ sauce for a gluten free version. The sweet potato fries were sweet, crispy, and very well seasoned, and came with about 5 different dips to choose from including chipotle mayo, garlic mayo, and BBQ sauce which were all delicious. The smoked cheddar cornbread came in slices like a cake, and had a layer of cheese in the middle, as well as grilled cheddar on top. It was moist and so flavourful, and was probably the best cornbread that I have had! It’s gluten free too and came with a steaming hot bowl of beef chilli on the side which was mild to medium spiced, and rich in beef flavour and spices. It was the ultimate comfort food, and the two went really well together. The onion strings weren’t gluten free but were definitely going down well with my friends. What are onion strings you ask? Think onion rings but crispier and crunchier, and as slices of deep fried onions instead of rings. The chicken wings were not gluten free either, but were crispy on the outside, juicy, seasoned perfectly and hard to resist. I liked that they were served in a bucket, and very reasonably priced at only £4 for 10! After our generous spread of food, we were feeling pretty full, but still looking forward to our main courses. These came out just as we were finishing up our sharing plates, so we cleared some space on the table for our next spread. A couple of my friends ordered the twisted cowboy burger which was made up of smoked beef with smoked bacon and cheese, crispy onion strings and their homemade BBQ sauce. 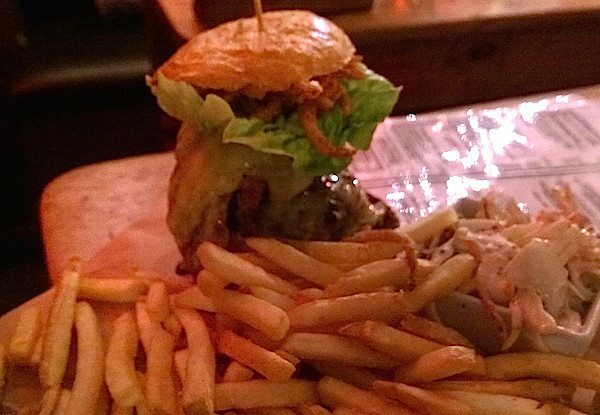 The burger was stacked high with fillings and was juicy and the taste of smoke was apparent. The buns were soft and well structured so they stood up to their fillings nicely. The shoestring fries were nice and salty and the crisp apple slaw gave it a fresh touch. We were also given a sneaky sample of their new house pickled slaw that will be replacing the apple slaw, that was also crisp, tangy, and delicious! The other burger ordered was the veggie stack which was also stacked high and held together with a skewer. The Veggie Stack was filled with a stack of roasted cajun spiced vegetables and smokey halloumi which was delicious. My friend next to me ordered the brisket that came with smoked garlic mash, greens, Harvey’s ale liquor and smoked cheddar cornbread. 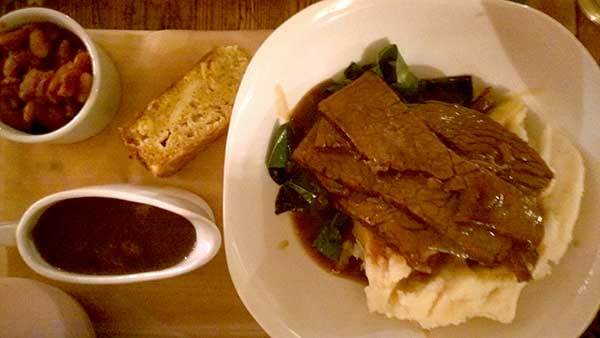 The mash came topped with thick slices of tender brisket, which fell apart as she cut into it and melted in her mouth. The greens were cooked well and added a healthy bitterness to the dish, and the mash was creamy and had a subtle taste of smoked garlic. My friend said the liquor was really good, it was rich and thick and so full of flavour, and she said there was obvious care put into making it. I ordered the cajun pulled pork, which tasted of coriander seeds, cumin, and orange, and was smoky and tender, it was so tasty. The BBQ beans it came with on the side were tangy and sweet, and the rice was nicely seasoned alongside the smoked cheddar cornbread that I love! This entire dish is gluten free. I wish I had taken a picture of our table after we had eaten as we had so much food, there was such a spread! A few people walked past and commented on our feasting, and told us about how much they loved the food as well, there are obviously some big fans of this place. They don’t usually serve dessert, as they said it’s not something that is often asked for, but sometimes have the odd special on, so check the blackboard if you feel like something sweet. This means that there won’t always be a gluten free dessert to choose from, but I don’t think I could’ve fit anything else in! 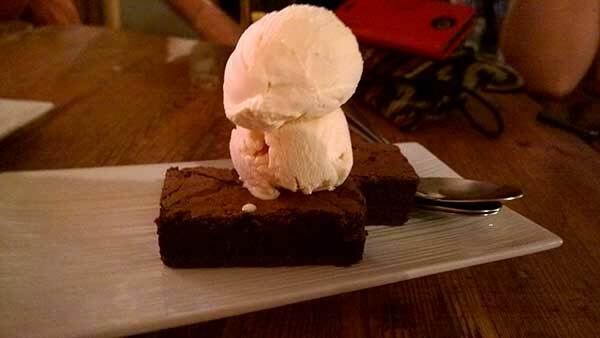 That evening there was a chocolate brownie with vanilla ice cream on the menu, (not gluten free) so my friends got a couple to share and they said it was rich and delicious. We all finished up our drinks and paid at the bar, and almost rolled out of the bar to head home after our tasty food. I would highly recommend heading down to the Druids Arms when you get a chance, whether it’s to enjoy a drink and a couple of small plates to share, or to sit down to a full Southern American style home cooked meal. With it’s excellent number of gluten free options and great vegetarian options too, Big Eats Co really does have something for everyone! Keep an eye out for their money saver deals during the week, including 2 meals for £10 every Tuesday, Wings Wednesday (5 free wings with every burger), and on Thursdays you can get a meal and pint for just £10, what a bargain! They also have takeaway available, and £5 lunch deals, and they are looking at offering delivery to the Brighton area very soon.